Discover today how Fractured brings the MMO and MOBA worlds closer by offering both meaningful choices and unparalleled flexibility! Hi, fellow gamer and MMO enthusiast! In the last Feature Spotlight, we’ve given you an overlook on the types of abilities available on Fractured and the Schools of Magic & Fighting that group them. In doing so, we’ve mentioned what attribute(s) influence the power of each school among the six available ones. Today, we’re going to discuss each attribute in detail – and while we’re at it, how your choice of race and family can influence your attribute assignment decisions during character creation. Last but not least, we will cover the missing bit of the Knowledge System – the Resting phase, through which the concept of “every day a new gameplay” comes to life. The choices you make in this phase are impactful, since they have a strong effect on how well your character will do when dealing with different ability schools and combat scenarios. They’re also persistent, in that you won’t be able change you character’s race and attribute distribution in game – unlike what you can do with talents and abilities. The choice of race is the most impactful you’re going to make in your Fractured experience. As already described in past dev journals, it determines on which planet you start your journey and the ruleset you’ll be subject to – something far greater than what you’ve likely experienced in other MMOs. Other than that, different races – and families – come with a set of advantages and disadvantages such as unique abilities and backgrounds, basic statistic modifiers and attribute variations – the latter of which are covered in the next paragraph. For more information on races and the planets they inhabit, we invite you to check out the first and second Feature Spotlights on our dev blog. Once you’ve selected your race, it’s time you decide how to set your main character attributes: Strength, Dexterity, Constitution, Intelligence, Perception, and Charisma. For starters, you’re given a pool of Creation Points that can be distributed among the six attributes – 100 if your new hero is a Beastman or a Demon, 120 if Human. Creation Points can be spent to increase your attributes from their minimum value of 6 up to their cap, which is normally 18 but can change according to the character’s race and family (as shown in the table below, which lists cap variations by race). If the value of an attribute is below 10, you’ll suffer maluses to all the statistics related to it – that’s why it’s convenient to raise each up to 10, particularly for inexperienced players. To exemplify, let’s say you’ve selected a Beastman character of the Nheedra family – a strong breed, but quite slow in reflexes and not the most apt to charm others (it’s a bear, after all…). You’re then able to raise your Strength and Constitution up to 20, but your Dexterity and Charisma only up to 16. There is an important catch here though: the relation between Creation Points and attributes is not 1:1! On the contrary, the higher you want to increase an attribute, the more Creation Points you have to spend. 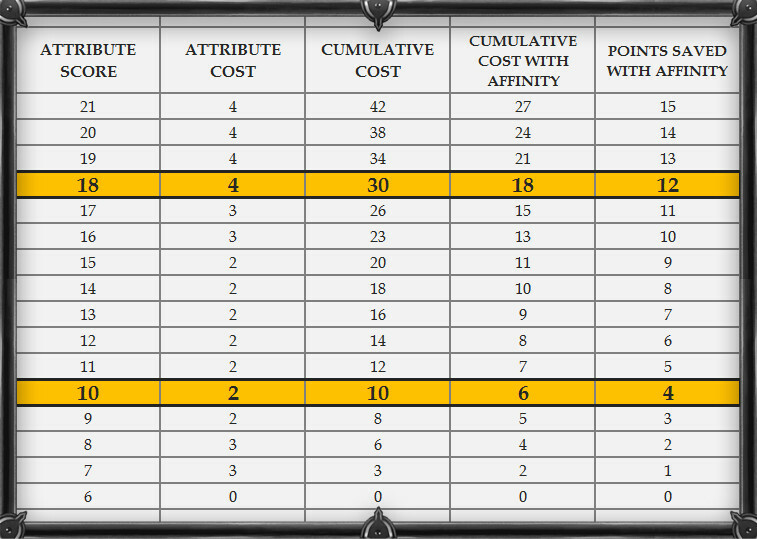 Moreover, each race and family (besides Humans) has an affinity with a specific attribute (highlighted in blue in the table above), which makes that attribute easier to increase. While affinity and caps might look relevant to nerds only, they’re not. Most bonuses given by an attribute grow exponentially with the score of the attribute – that is, points allocated from 20 to 25 are far more effective than points allocated from, say, 10 to 15, thus making cap variations determined by race selection quite significant. Furthermore, reaching a Natural Score of 20 with each attribute grants an additional unique bonus to the character. What’s the Natural Score of an attribute? It’s the sum of your basic score, defined at character creation, plus points coming from talents. Indeed, each branch of the Talent Tree contains talents that grant a total of +2 to a specific attribute. So there you go – even a poor Human who enjoys no cap modifiers can score a 20! In this last step, you can choose the past of your character. Each kind of background grants you a different set of abilities already learnt to level 1, plus some known crafting recipes and starting equipment. One thing worth noticing is that all character backgrounds available are pre-defined – you can’t choose the exact abilities, recipes and equipment you already know/own. This choice has been taken to make new heroes always start with a set of abilities and equipment that synergize properly with each other, allowing new players to have a more effective early game experience. Once your character learns new abilities and gains talent points, its background will no longer be significant anyway. For more information on ability learning, talents and overall character growth, check out the last Feature Spotlight on the Knowledge System. The following paragraphs cover the effect of each of the six attributes in brief. For more information on what types of abilities they influence in detail, have a look at the Skills & Spells Galore spotlight! Strength is a measure of the raw physical power of your character, determining how hard it can hit with melee attacks, how much weight it can carry, its base armor rating, its ability to intimidate other creatures and to break objects. It also grants a significant bonus to maximum life, and is used as a requirement to equip heavy armors and weapons. Reaching a Strength score of 20 gives the character a unique powerful boost to melee damage. Strength is the main attribute for heavy melee hitters that want to deal the highest damage in the game, being able to double-wield large weapons or hold massive 2-handed ones. A character heavily focused on Strength wants to end a fight as quickly as possible with a small amount of devastating hits, stunning and knocking down its opponents, especially as it often lacks the physical and mental resources to sustain lengthy battles. Dexterity is a measure of the speed, nimbleness, stealth and sleight of hands of your character, determining its accuracy and evasion ratings, the cooldowns of combat-related and mobility-based abilities, the chance to inflict critical hits, the stealthiness of its actions and its skills with traps and lockpicks. Reaching a Dexterity score of 20 gives the character a unique powerful boost to evasion ratings. Dexterity is the main attribute of nimble fighters and furtive characters that wear light equipment to prevent armor from interfering with their combat abilities and hold (or double-wield) small, fast weapons. Characters heavily focused on Dexterity can avoid critical hits while inflicting them on their opponents with surgical precision. Reacting quickly to any situation is the key to their success – and they have all they need to do so effectively. Intelligence is a measure of the learning capabilities and magical power of a character, determining its memory, its ability to understand unidentified items, the intensity and cooldown of its magical spells, its ability to persuade people with logic and natural resistance to magic. It also determines the maximum value of Mana and its regeneration rate. Reaching an Intelligence score of 20 gives the character a significant boost to Mana regeneration. Although Intelligence is an obvious requirement for aspiring mages, it’s really unwise not to raise it to a score of at least 10 during character creation, disregarding the type of hero you’re trying to build. This is because Intelligence plays a key role in learning new abilities faster and allows a character to memorize more abilities at the same time, as explained in the next chapter. Magic tricks and incantations represent the full extent of the offensive and defensive power of a sorcerer, making the increased memory given by Intelligence particularly useful. Moreover, a reliable pool of mana can make the difference between success and defeat, especially since powerful wizards usually achieve their powers sacrificing most of their physical strength. Constitution is a measure of the physique and endurance of a character, determining its natural resistance to poisons and natural elements, how much it can carry and the response of its body to potions. It also determines its maximum amount of Life. Reaching a Constitution score of 20 gives the character the ability to slowly regenerate Life over time without external intervention. Given the impact of Constitution on the resilience of your character, it’s also recommended you don’t lower it too much, unless you’re planning to be able to defend yourself otherwise through magical means. Fighters willing to enhance their powers with alchemical concoctions also benefit significantly from a high Constitution score, which not only increases the effect and duration of most potions, but also grants the character a natural resistance to the negative side effects of the most powerful ones. Perception is a measure of the accuracy and observation skills of a character, determining its chances to score critical hits and the damage they do, its accuracy rating, its ability to instinctively identify items, to spot hidden creatures, traps and treasures and to find valuable resources while gathering. Reaching a Perception score of 20 gives the character a significant boost to its accuracy rating. Some people need years of study and practice, others just get it naturally… Instinct, keen sight and acute intuition are essential for bounty hunters, rangers, and assassins. Their senses give them a natural expertise with most weapons and combat techniques, and allow them to quickly identify the best magical items and valuables among unclaimed treasures and the corpses of their victims. Charisma is a measure of the leadership and mental abilities of a character, determining the amount of pets and companions it can control at once, its ability to charm other creatures and its affinity with mental abilities, which increases psychic damage and psychic resistance. It also grants a moderate bonus to item identification, makes interactions with NPCs easier and more effective, and determines the base luck of the character. Reaching a Charisma score of 20 gives the character a significant boost to its luck. Some say luck is blind, but knowing yourself and having faith in your abilities often helps a lot! Charisma is used by leaders and kings to raise among people, by minstrels to convey emotions to the souls of their audience, by tricksters to deceive their victims with illusions, and by trainers to earn the respect of their pets. When chances between life and death depend on the throw of a dice, Charisma makes the difference, skewing the balance towards the best result. As already explained in our first journal on the Knowledge System, your character can eventually learn all the abilities available in the game, but he’s only allowed to use a subset at the same time. This limitation is where Fractured flirts the most with the MOBA genre, allowing you to shape a different “hero” before embarking in any kind of adventure to better tackle the scenario you’re going to face or find the right spots in your friends’ party. In this chapter, we’ll be discussing how this feature is implemented in practice by outlining its two core mechanics: resting and memorization. The resting mechanic is quite straightforward. When you start a resting phase, your character sits on the ground, and you are presented with a menu through which you can re-assign your talent points and choose the spells and abilities you want to memorize for your next adventure. The amount of memorized abilities is not fixed, but is positively influenced by the Intelligence of your character. Resting involves no forced waiting time – once you’ve made your decisions, just confirm them and your hero will be ready to go. Moreover, it will have recovered all of its Endurance, Life and Mana, and be cleansed of all negative status effect (besides long-term curses). There’s no limit to the amount of resting phases you can take in a day – but of course they would lose all their strategic importance if you could have one at any time! That is why you can rest only in a safe location where your character can sit in front of a fire – be it your home, a friend’s mansion, a public tavern, or even a proper temporary camp. As we explained above, the amount of abilities you can memorize during a resting phase is not fixed. This means their number can be greater than what fits the ability hotbar at the bottom of your screen! How are you able to use them all in combat then? Well, you can’t – not at the same time at least, since spells in your hotbar are the only ones you can actually cast. At any time when out of combat, however, you can take an ability out of the hotbar and replace it with a memorized one of your choice. This operation is not restricted as resting phases are – it’s enough you aren’t in the middle of the action really! Now that we’re done with the Knowledge System and all its shades, it’s about time we move to a whole different topic – another one that plays a major role in the Fractured experience: town building, management, and conquest! Inhabitable areas: where can you build, and what? Town states: haunted, ruined, unclaimed and claimed cities. Conquests: massive sieges or open field battles? Organization: keep your town running properly! See you soon and, as always, don’t forget to let us hear your voice on our community boards and social media! The Fractured Pre-Alpha Is Coming!